Amanda and Stephen met at Bishops University. Amanda was in her final year and Stephen was just completing his first year when they starting dating. After graduating Amanda moved back to Montreal and began working while Stephen remained at Bishops to complete his degree. They continued dating long-distance for two years until Stephen graduated and moved to Montreal to be with Amanda. Shortly after moving to Montreal Stephen proposed to Amanda and they got married a year later, bought a house and began their life together. In 2010, Amanda and Stephen found out they were going to have a baby girl! They took great joy in preparing for the coming of their little princess and in January 2011 Lauren Olivia Loughheed was born. She was beautiful and brought so much joy to the whole family. Lauren developed normally and was meeting and even exceeding developmental milestones for the first 9 months of her life. She was smiling, laughing, and playing in her jumparoo. Lauren then began to slow down, no longer sat up on her own and started to become irritable. In November 2011, after doing an MRI and a host of other neurological and metabolic tests, Lauren was diagnosed with Krabbe Leukodystrophy. 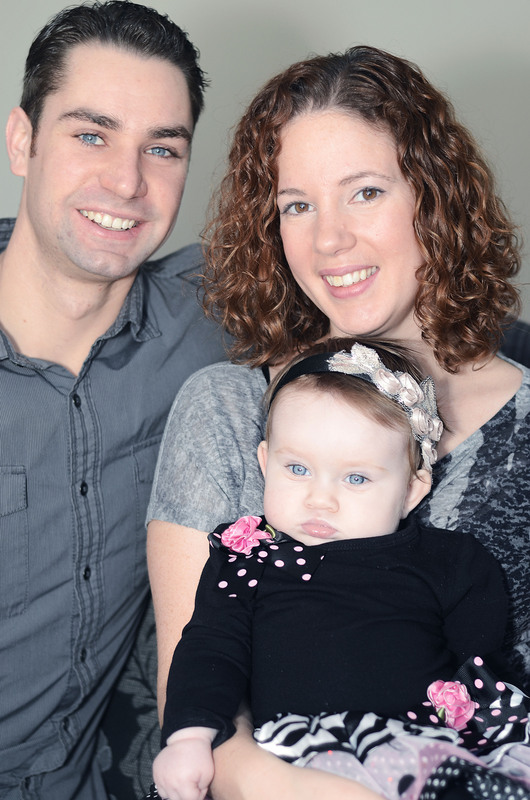 Since the diagnosis, Amanda and Stephen have been re-structuring their lives to provide care for Lauren. For updates on Lauren please feel free to subscribe to the blog. Our dear Lauren lost her battle to Krabbe Disease on April 13th 2015. I have had so much trouble updating this blog since. We miss her so deeply. She was 4 years and 3 months old when she passed. That is three years more than our initial diagnosis – Three years of extra kisses, snuggles and hugs but at the same time not nearly enough. We lived for every minute and every breath. She left us the legacy of learning to live for the moment. Every day and every minute is a gift, a lesson that we will always appreciate. On July 2nd 2015, we were blessed with the birth of Lauren’s sweet little sister Zoe. Like her sister she is very cute and sweet. We love her so very much, and we are sure that her big sister is smiling down upon her. You two are the strongest people I know and Lauren is very lucky to have you as her parents! I found your story through a post on Facebook (via Jenn Munro Photography) and have read all your blog posts. You are truly inspiring. I’m a first time mom to 14 month old twin girls and when days get crazy I stop and catch myself thinking of Lauren knowing that things are a bit crazy for you all and I stop and say a little prayer for you 3. I prayer for Lauren to have the happiest, healthiest life she can and please know that your family is in my thoughts and prayers often. God Bless You all! Thank you for thinking of us Mary-Ann, we really appreciate your prayers. i know savhanna, laurens grandmom and she always talks about lauren! i just wish i would now little lauren personally she seems like she has so much life! she must be such a blessing! i m praying in my thoughts for her life to be fufilled and long and that jesus will give her the strenght to carry on! I also first found out about your story through FB and Jenn Munro and I read your blogs regularly. Although as a mother, your story breaks my heart and I can’t even begin to imagine what you and your family are going through, I can’t help but hold onto hope that a miracle will happen. You both seem like amazing parents and your kindness, love and positive attitudes bring tears to my eyes whenever I read your blog. Lauren is absolutely beautiful [and those cheeks … you must kiss them a thousand time a day 🙂 ] – I think you’re both giving her such amazing opportunities to experience life and I truly admire your strength. Please know that your family is in my thoughts and prayers often. We met in a dog’s park last week-end in Beaconsfield. I have been impressed by your maturity. You have a lovely child with marvelous blue eyes. I am a bit speachless… with mixed feelinds such as angryness, being confronted to such injustice of life. I wish you strengh to keep on in this epic journey. It was an honour to meet you both yesterday at the event held by MAB-Mackay Foundation. I am in awe of your courage, strength and positive attitude despite facing every parent’s worst nightmare….the loss of a child. It has been over 8 years since we received the horrible diagnosis of a terminal disease for our beloved Justin. Although we were told that he would not see his 2nd birthday, Justin defied the odds and blessed our lives with 6 years of constant smiles, chuckles and love. These children are angels on earth. Lauren is fortunate to have two parents like you, and you are so lucky to have a beautiful daughter like her. Your family is in my thoughts and heart. I only wish I could find the words to speak what my mind thinks. Your baby girl is beyond beautiful. She is one of the most gorgeous children I’ve ever laid my eyes on! I am so happy for you that you are able to do the things you’ve done with your Lauren. She and you, her parents, are in my prayers and thought of often. Thank you Celeste! Lauren is an amazing little angel 🙂 we just focus on living with joy and maintaining a full life for her.